Parameter object is improperly defined. Inconsistent or incomplete information was provided"
We really only have one depth for the water, but have "faked" a Depth2 thinking there had to be information in all columns. Can anyone see an obvious problem with my file? Do the cells in Excel have to be a particular format (e.g. Bore must be "text", Date must have a particular date format, Depth1/2 must be "number", etc.? Thanks for your question. 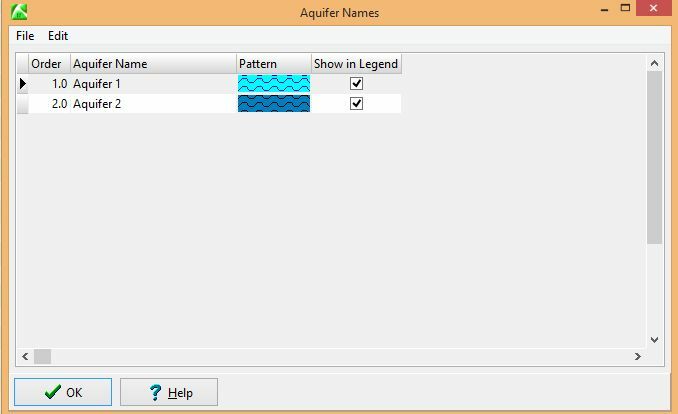 The only thing that comes to mind immediately is whether or not you have the aquifer names in the aquifer types table. If they aren't in the types table, then RockWorks can't make the association it needs to in the database. Here is the aquifer types table for the Samples project. Another item to check is the date format. RockWorks will assume that the dates comply with the "expected" format as defined in your Windows Control Panel. If Windows is set up with a date format of "21/09/2015" for example, then an entry of "21-SEP-2015" may not be recognized. You are welcome to email your spreadsheet to us, at support at rockware.com, being sure to include the Windows Regional Settings date format so that we can try to create your system. That seems to have been my problem - the date format. Once I changed it in Excel to match my Windows system format, all the data imported properly into Rockworks 16.